Instant Pot BBQ Chicken. Juicy, sweet and sour and totally delish, this dish is made from scratch and it makes you look good with little effort. But why would you make this traditional barbecue dish in the Instant Pot? I remember when I first came across a BBQ Chicken recipe for the Instant Pot. My first thought was – “what a pointless exercise!” Pressure cooking doesn’t get the caramelization needed to make a good barbecue, I thought! For a change, I was right but only about the caramelization. 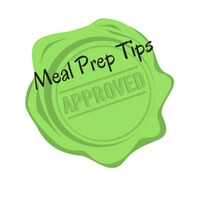 What the Instant Pot does really well is to cook the chicken to perfect juiciness. Caramelization can be added, if needed, with a quick baste and grill. That brings me to my cheat’s version of BBQ chicken drumsticks. 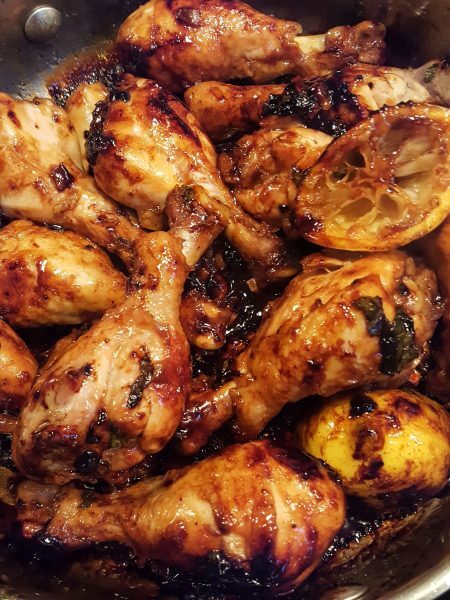 With this recipe, you end up with juicy barbecue chicken made faster and easier with all the feel of a relaxed summer’s day….. on a crazy Thursday night! While the chicken is cooking, make the sauce. See the ingredients below. 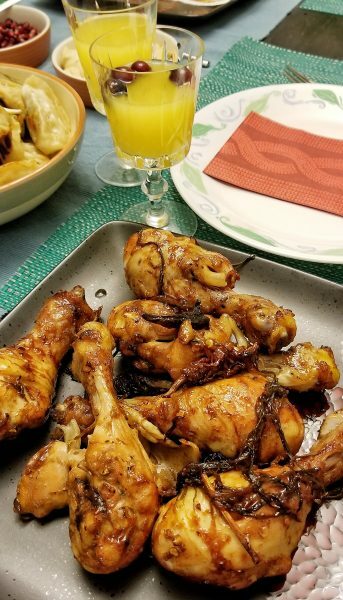 If you’re making a small number of legs for your family, transfer the chicken drumsticks to a hot pan, pour the sauce on top, toss and coat and let it all caramelize. If you’re making a big pot like I often do, toss the cooked drumsticks with the sauce in a bowl. Grill for 4 mins each side. 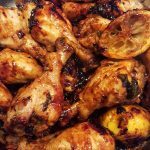 Why Make BBQ Chicken in the Instant Pot? This is the 64 million dollar question isn’t it? It was for me. 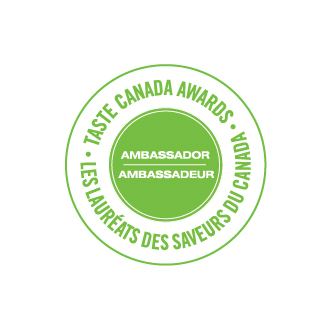 The quick answer – it saves time. The long answer – BBQ chicken legs in the oven are also good but they take a while. Further, if I’m not ready to flip them at the right time or baste enough, they dry out. 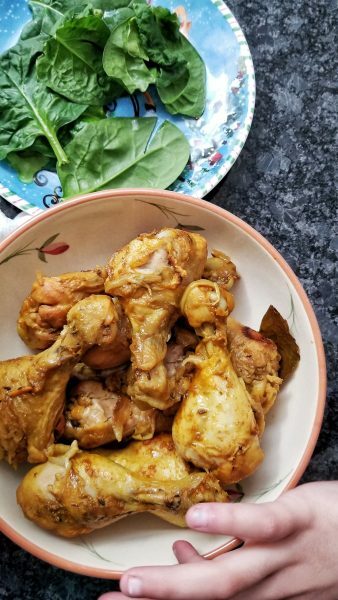 When I cook drumsticks in the Instant Pot I can make a big batch beforehand and they cook consistently and remain juicy. I can also cook them from frozen. Just add 5 mins to cook time in the Instant Pot. I would never consider cooking chicken from frozen on the barbecue! Make as many as you can fit in your Instant Pot. These go fast. I cook till Step. 2 on Sundays and then caramelize during the week. 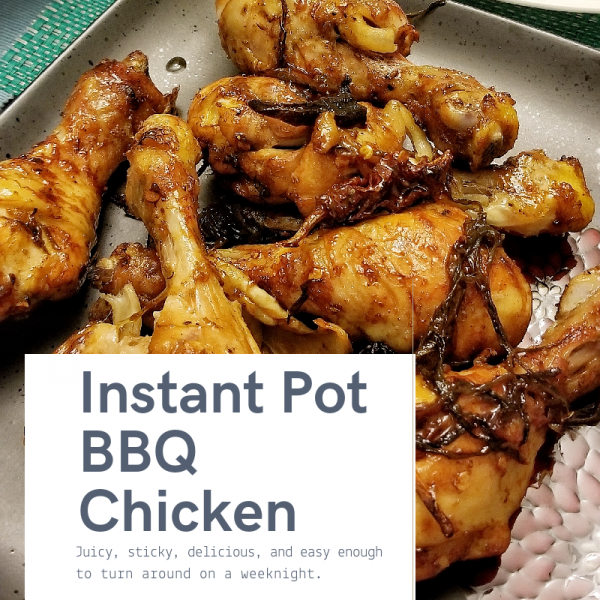 This Instant Pot BBQ Chicken dish is a hit during the summer as well when I make a big pot beforehand. The grilling can be done outside. 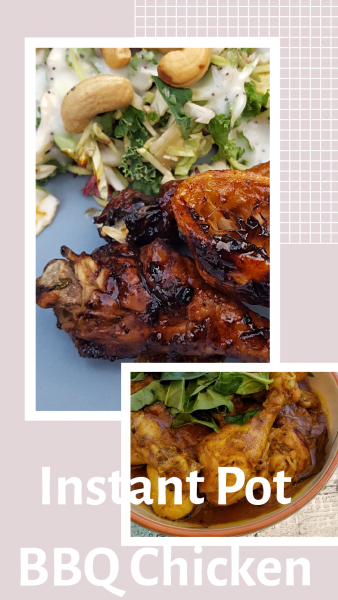 Instant Pot BBQ Chicken Drumsticks – a dish that is juicy, sweet, sticky, sour and totally delish, and with my meal prep tips easy enough to turn around on a crazy weeknight! Add Oil and add whole spices. Add Onions and toss in oil. Add Chicken and saute. Add 1/2 cup of water. Switch to manual 15 High Pressure. In a comfortably sized pan, add onions and sticky ingredients and toss. Add the juice and stir. Toss drumsticks and sauce together. Grill in a hot pan or under the broiler for 4 minutes each side. Reserve any remaining liquid from the Instant Pot and the sauce. Mix it together and offer it to your guests as liquid gold. It is. Serve with rice or salad or naan. Or all 3, I won’t judge.